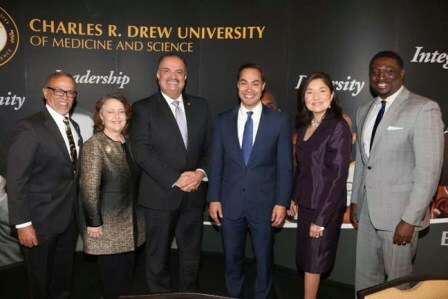 Julián Castro, a candidate for the 2020 Democratic presidential nomination and former U.S. Secretary of Housing and Urban Development under President Barack Obama, provided the keynote address at a panel discussion entitled “Diversity in Higher Education: Race Matters” at Charles R. Drew University of Medicine and Science’s (CDU) fourth annual President’s Breakfast on Tuesday, February 19, at the Marina Del Ray Marriott. The panel was moderated by CDU President/CEO Dr. David M. Carlisle and featured other notable leaders from academia, business, philanthropy and healthcare who have been champions of equality. Panelists included Wendy Garen, president and CEO of the Ralph M. Parsons Foundation, Wm. Jahmal Miller, MHA, DHL, director of Corporate Reputation and Thought Leadership at Blue Shield of California, Francisco Rodriguez, PhD, chancellor of the Los Angeles Community College, and Maria Salinas, president and CEO of the LA Area Chamber of Commerce. Secretary Castro noted the tre­mendous competition we face as a na­tion and the importance of providing access to education to all. “The U.S. needs well-educated people now more than at any time in our history,” he said. “If we want to compete in the 20th century, there’s not a single person we can waste.” But he decried the income inequality that makes it difficult for many—especially those from communities of color—to get the education they want. “America is the land of opportunity, but it’s also an America in which it’s more and more difficult for people of color to get ahead,” he said. He called for the nation to “invest early in the success” of children in under-resourced communities, especially those at pre-kindergarten age, “when the child’s mind is growing,” and to “make higher education more affordable and accessible,” including four-year universities, communities colleges and apprenticeship programs. Presenting sponsor for this year’s President’s Breakfast was Torrey Pines Bank. Advocate for Higher Education Access Sponsors included L.A. Care and L.A. County Second District Supervisor Mark Ridley-Thomas.